1024 runners finished within the 5:40 time limit. Good running conditions (fine, no wind, 12°C) led to some fast times in this 23rd edition of the race. Lahoucine Mrikik set a new men's course record and Japan's Tomo Morimoto ran the second fastest women's time ever recorded in Vienna (behind Maura Viceconte's 2:23:47 mark from 2000). This year's motto "Run Vienna, enjoy Mozart" drew in 23,961 participants in all the various events. Classical music was played along the marathon course through the city. The men's race was fast from the beginning: 5km passed in 15:05 and 10km in 30:16. In the middle of the race it slowed slightly, and eight runners passed the half way mark in 64:22. Samson Kandie's 2004 course record (2:08:35) then seemed to be slipping away when 30km was reached in 1:31:48. Just before then Mrikik and Peter Chebet went ahead and at around 38km the Moroccan again stepped up the pace. He clocked 2:55 minutes for the next kilometre and took a decisive lead. "Today everything was perfect: my form and the weather conditions", said the 34-year old winner - who had entered the race with a personal best of 2:13:31. 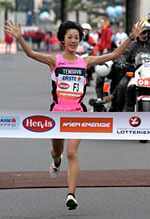 Tomo Morimoto ran the 12th fastest time of the year with in her first race outside of Japan. Chieko Yamasaki and Mary Ptikany had passed 10km together with Morimoto in 34:24 but before reaching 20km Morimoto, who had run a 2:27:16 marathon debut this year in Osaka, broke away from the others. At half way (1:12:31) she was already 25 seconds clear of Yamasaki. Fourth placed Susanne Pumper broke the Austrian record. 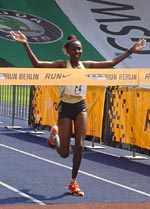 The Kenyan win streak remained unbroken in the 26th edition of Run Berlin through the efforts of 21-year old Patrick Musyoki, who finished in the second fastest time of the year. He almost missed out on victory, because he took the wrong turn just inside the Olympic Stadium. But he corrected himself immediately and ran the last 400m very strongly. In the women's race Peninah Arusei improved her personal best by more than three minutes. A total of 10,495 participated, with 6,186 of them in the 25km race, 2,966 in the 10km Nike Challenge fun run. There were also 724 inline skaters and 30 teams in the 5x5km relay. In the kids race 366 ran and 103 children participated in the junior skating race. Right from the start a leading group of nine men ran their own race. "After 10km the pacemakers were too slow. So I pushed the pace a bit. At 23km I knew I had a chance to win, so I increased the pace," said Musyoki. He ran the last kilometre in 2:43. The pre-race favourite Elijah Sang let the lead pair get away 3km from the end. It is the fifth time in a row that Kenyans have swept the top three men's places. Peninah Arusei's win made it six in a row for Kenyan women. The first 10km were fast (34:22), and slightly downhill. Arusei led the field from the beginning and after 9km she ran the rest of the race alone. Seven of the top eight finishers (all except Pavel Loskutov) were misled by officials at 9.4km and ran about 100m short of the full distance. Despite a complaint by Loskutov, the results were allowed to stand, but the times recorded should not be included in any official statistics for the half marathon. It was fast from the very beginning. 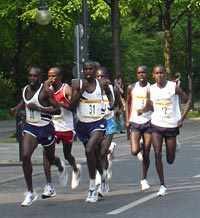 A group of Kenyans were closely trailed by three Moroccans. Loskutov followed at a distance of about 50m after the first 5km. After the incident at 9.4km Salil and Kipchirchir increased the pace broke away from the Mouazziz brothers. Over the second large bridge (15km) the experienced Abdelkadir El Mouazziz took over the lead and went steadily ahead for a 36-second winning margin. His younger brother Abdelhadid passed the Kenyan pair as they faded badly after 15km. The women's race was completely controlled by Helena Javornik, the experienced Slovenian runner. She broke away from last year's winner, Susan Kirui, at the halfway mark and won by more than a minute. Behind her Anna Rahm finished strongly to pass Kirui on her way to a new personal best. The Swedish marathon record holder, Lena Gavelin, made an encouraging comeback in this race. 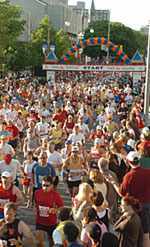 Of 35,780 entered, 26,600 finished the race. Marathon Weekend began on the Saturday with the 8km City Run attracting 3,800 runners and the 4km Family Run 5,300 participants. Two in-line events (15km and 5km) were also run on Saturday, with 1,022 skaters taking part. The runners and skaters took off to the beat of the monstrous Marathon Music Festival, featuring several very enthusiastic Brazilian style drum bands, dancers, jugglers and acrobats and an epic 11-hour main stage performance, featuring top Czech bands. Next day the Marathon began in near-perfect conditions with cool temperatures, as 4082 runners from more than 70 nations were set on their way by Czech President Vaclav Klaus. Hassan Mbarak Shami went through halfway in a group of six (1:04:28), but by 33km he was almost 500m ahead of David Kiyeng and Joseph Ngeny. Kiyeng stuck to the pursuit and by the finish line he had significantly reduced Shami's lead, but it was too late. Stephen Matebo kept away from the early pace and came through, while John Rotich was in an isolated fourth place at 33km but faded in the later stages. The first three in the women's race passed through halfway in 1:13:44, and only began to break up at around 32km as Alina Ivanova pushed ahead to a clear win. The race incorporated the Bavarian Championships. It was the closest race ever. Two Kenyans chased the pace car to the finish line, both of them sprinting but neither faster than the other. They crossed the line together, only 20 seconds outside the course record. In the women's race the record holder Olga Nevkapsa at first ran with the pacemaker Kim Bauermeiser, aiming for 2:33. After halfway she found the heat troubling and slowed, to eventually fall a minute short of her own record. The best performance of the day came from Alem Ashebir. The young Ethiopian, with a personal best of 1:12:50, easily beat the old record and was ten minutes ahead of her competition. It was a great sight to see as 5,350 participants came through the start. A fantastic atmosphere was generated by around 30,000 spectators. Kenyan athletes dominated the men's marathon filling nine out of the top ten places and with Benjamin Bitok beating last year's inaugural course record by 6:20. On this hilly course, at 1650m altitude and at 20-23°C, it was an impressive performance. In the Half Marathon Disi Dieudonne made up for missing last year's race by outsprinting Tanzania's John Rogart in the finishing straight. A lead group of 11 runners stayed together on the two-lap course until the last 5km, when Dieudonne and Rogart got away. Entering the national stadium Amohoro, thousands of spectators were stood up to fanatically cheer their local hero on. He sprinted strongly in the last 250m to secure victory and beat the old course record by 1:41. The Kenyan pair of David Biwott and Evans Nyangwara led out, but before halfway was reached Biwott went ahead. Slower-starting Eduard Tukhbatullin came through to take the runner-up spot as Nyangwara tired over the final 10km. Women's winner Ida Kovacs also held back in the early stages as Tatyana Perelpekina led. Kovacs took over from half way and built up a four-minute winning margin. In the half marathon Helena Javornik raced away to win by over 15 minutes. It was a close race for the first two places, although both Torben Nielsen and Thomas Sondergaard had lagged early leader Josphat Mutai by 91 seconds at halfway. In the women's race there was a similarly ambitious start from Martina Schwanke who led Nina Madsen and eventual winner Kathrine Tilma by 100m as she passed through halfway in 1:23:26, only to fade to sixth. A 22-year old record was shattered in the women's marathon by Canadian Lioudmila Kortchaguina who finished with a new course record and personal best, a long way ahead of her opposition. 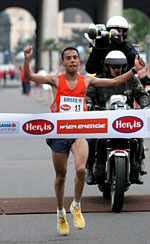 In the men's category, Morrocan Abderrahime Bouramdane was declared the winner, ahead of his fellow countryman Zaid Laaroussi. The yawning gap between second and third places - almost 12 minutes - hints that something untoward took place. Between 8km and 9km 14 runners inadvertently cut the course, and the first six finishers were disqualified, plus several other stragglers who had also gone off course. The main pacemaker, Nicodemus Malakwen took the race out fast: 1km in 2:50; 3km in 8:58. Only the other two pacemakers, and the Moroccan pair of Abderrahime Bouramdane and Zaid Laaroussi went with Malakwen. By 5km [15:04], this group had a big lead. The flat, scenic course then entered the New Edinburgh neighbourhood of tree-lined streets, and lots of turns. The lead vehicles and the first group followed the correct course, but the trailing pack, out of sight, somehow got turned the wrong way and emerged from a side street around 9km, some 200m ahead of the lead vehicles and runners, having cut off between 400m and 500m. The lead vehicles went on ahead of the "short-course" group, leaving the "full course group" of Moroccans and pacemakers behind the new lead pack. By 22km, the Moroccans caught the pack, and were then content to run with their new group of 12 extra pacemakers. When assigned pacemakers pulled out at 30km, Kasime Roba of Ethiopia and the Kenyans started to race. Bouramdane initially made a move to go with them, but compatriot Laaroussi told him to hold back, saying: "no problem, they will all be disqualified." So it proved, as the Moroccans cruised in for first and second in 2:12:18 and 2:12:59. Third place was awarded to Brad Poore who finished behind a dozen of the short-course runners. There was also a new record in participation as 29,364 runners took part in the nine races on the schedule, with 4216 in the marathon and 8274 in the half marathon. There were also 10km and 5km events in each of which around 7000 participated.